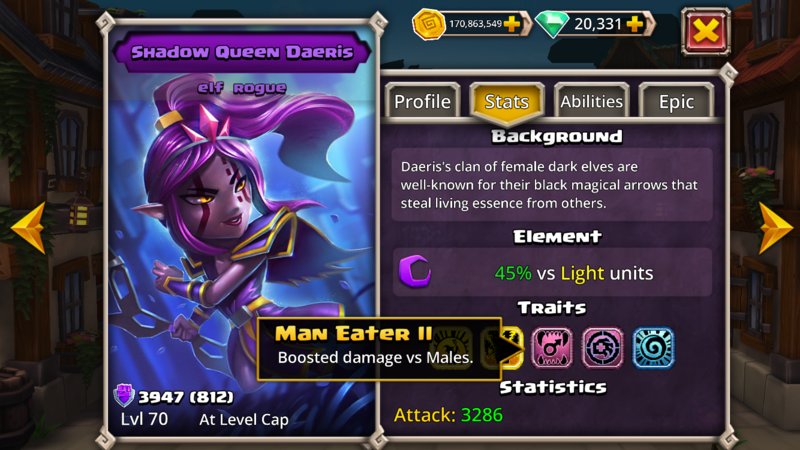 I’ve always assumed bonus damage for Daeris is vs anything that is not female. I agree. Constructs technically don’t have one, so it shouldn’t affect them. I get that the Undead take bonus damage since, as far as I’m aware, all the Undead heroes were once men. Just because something doesn't affect you doesn't mean it isn't important. ...What I'm saying is, just because you don't use Daeris, doesn't mean her passives don't deserve some more clarity! Whenever I go out looking for women, all the arrows over their heads are red. One day when I meet Victoria, I hope to see a green arrow. What color is the arrow over your wife's head? I learned that from Oprah Sunday! I noticed today that Daeris also deals bonus damage from her passive to the Skullbat Lava Queen in the gold dungeon. I’d imagine all Torchy clones are simply counted as male, and that it’s not going to ever be fixed, but it’s worth noting I think. I guess Skullbat Lava is a drag queen. Maybe daeris is an annoying feminist. Either that or androgynous. Probably not though, since bats aren't clownfish. I think they do generally follow the "tough characters are males" sort of system except when it's obvious like Abigail. for generic heros in dungeions, it would be a 50/50 male or female chance when the gender isn't appparent. I would also assume that constructs would be genderless. I say that Agron Phenol are genderless, since they were both created by magic. Also, I just realized that all of the royalty in-game are men! Maybe the legendary dragon leader could be a queen, like Tiamat from D&D. Well not exactly, but look at all of the character models, all their faces are based on Gender, so just imagine instead of man eater it said square head eater. Very disappointed that no-one replied to "what is a man" with "a miserable little pile of secrets". Have at you! for the love of something, is that really the best reply i can come up with?